Butterflies might like Biden alba but I sure don't! Bidens alba is an easy plant to dislike. I haven't liked it for close to 20 years. Also known as Spanish needle, burr marigold, cobbler's peg and (my favorite) demon spike grass, Bidens alba has mastered the art of botanic adaptability. It grows along parched strips of roadsides and disturbed earth just as easily as it does in the rich, well-irrigated soil of flower beds or lawns. Native to South America, it has spread to every continent except Antarctica. It's easy to understand why the Chinese call it xian feng cao, or "abundant weed." In Central Florida, Bidens alba is most obvious in early autumn. By the end of September, small plants that would have been easy to dislodge earlier in the season are deeply rooted, full-size specimens, often topping out more than 3 feet tall and equally as broad. The flower heads — small white petals surrounding orange centers — are a "nothing special" bloom, too small and irregular to be pretty and lacking a pleasant fragrance. The hairy stems have a tendency to bend over and re-root. After years of pulling out the offensive plants only to find myself with an itchy rash on my arm, I learned that contact with the hairy parts causes a bothersome irritation in people who have sensitive skin. That's odd, because one of the many herbal uses of Bidens alba is to crush the flower heads and rub them on insect bites to relieve irritation and swelling. Go figure. Although I'm not wild about this plant's flowers, leaves or growth habit, what I particularly loathe are its seeds. Demon spike grass has "hitchhiker" seeds that attach themselves with unyielding tenacity to anything that brushes by. That means if you go for a walk in the woods or alongside a road where Bidens alba is growing, you will return home with dozens of these miniature barbed bayonets clinging to your shoes, shoelaces, socks, pants or skirt. Removal is not easy. The slightly curved, rigid black spikes grab at fabric as fiercely as ticks attach themselves to skin. A comparison to ticks is not far-fetched. 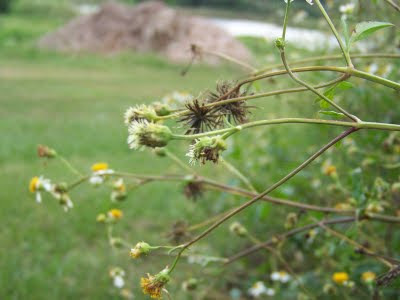 Another common name for Bidens alba is beggar's tick, a reference to the seed-covered clothing of hobos walking along railroad tracks. All too often, Ralph has come in from working outside with his white crew socks skewered by the black seeds. Picking off the seeds is a tedious, profanity-inducing process, but it shows why this plant is so widely distributed. Wild animals, birds, domesticated pets and livestock have inadvertently transported demon spike grass around the planet. With so much going against it, I was surprised to learn that instead of despising this invasive weed, people in some cultures actually appreciate it. Sub-Saharan Africans eat the fresh, tender young leaves as a vegetable, while Ugandans prefer their leaves boiled in sour milk. In Mexico, the seeds find new life as a stimulating substitute for tea, while Filipinos make wine out of the flowers. All parts of the plant — roots, leaves and seeds — have herbal properties. Bidens alba purportedly has antibacterial, anti-dysenteric, anti-inflammatory, antimicrobial, antimalarial properties. It is even under study for anticancer characteristics. Although few Floridians know it as anything but a noxious weed, many of us have noticed its popularity among butterflies. It is the preferred food source of the Gulf fritillary, orange long wing and zebra long wing. After learning about its many uses, I figured I should re-evaluate my feelings for Bidens alba. I thought about its use as a medicinal herb, a food source, a butterfly attraction and livestock fodder. I considered its potential in the fight against cancer. I tried to like it. I really did. In the end, the best I can do is to admire its tenacity and accept its presence. Despite the plant's attributes, I still see demon spike grass for what it mainly is: a seedy hitchhiker on the horticultural highway of life. Ah, well, no one says you have to like everything. Is there an easy este to get the needles off soft cotton clothes? My clothes are filled with them from weeding. I wish I could tell you some simple way to remove the seeds from clothing but there really isn't one. I pick them off one-by-one until I've gotten them all. That's what makes Spanish needle such an annoying and intolerable wildflower/weed. I'm just now seeing this article, but I'm so glad I did! Spanish Needle is my very favorite wildflower. I know that they are invasive, but their hardiness is one thing I like about them. The nectar that honeybees gather from Spanish Needle makes the most wonderfully rich-flavored fall honey. As an apiarist, this is important to me! And, as an aside, the appearance of Spanish Needle blossoms is an indicator of fall returning - and fall is my very favorite season! Again, thank you for the article and the photos! Very enlightening! i wish i could try some spanish needle honey. maybe it would help me improve my appreciation for this plant. this year we haven't had time to be as diligent about weeding out bidens pilosa as we usually are. the result has bee an explosion of spanish needle plants all over the property. if we kept bees, they'd be thrilled with such a ready source of nectar.